Overdue Book Reviews – Demon Fish and Sharks of North America – Ya Like Dags? I’ve reached that point where I’m starting to apologize in each post for how long its been since the previous post. Well, no more apologies. I’ve been buried in both starting the PhD and finishing the Masters, and unfortunately the free time to post has been rare. The workload should be lightening after next week, so your continued readership is much appreciated and will (eventually) be rewarded. In the meantime, here are some shark-related book reviews to remind you that this blog exists. One book I should have reviewed a while ago after finishing it, the other I just got in the mail a few days ago. So these reviews will reflect one book I’ve had a while to stew over (and frankly, not think about for a while) while the other will be laced with the thrill of new stuff. Caveats stated, let’s review some shark books. This is the one that I had every intention of covering back when it was hot off the presses this summer, though plenty of other shark blogs of note gave it the attention it deserves. Juliet Eilperin covers science for the Washington Post, and her experience witnessing the intersection of science and policy likely prepared her well for writing what may be the most comprehensive look at the relationship between sharks and people out there. 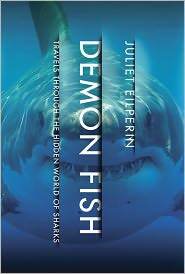 And that relationship is stressed; where most shark books focus on the sharks or some aspect of human/shark interactions (usually attacks), Eilperin maintains a focus on how humans and sharks are very much a part of each others’ lives. This includes a thoroughly-sourced overview of the importance of sharks in human history, the fin trade, conservation, and fisheries. Though a pro-conservation stance is taken throughout, there are some surprises here, such as the humanization of such common villians as shark fin brokers and Mark “The Shark” Quartino. This is all presented in plain language, making it a quick but well worthwhile read. Non-scientists can pick up this book and learn quite a bit about sharks (and their sometimes subtle influence on society) very easily, but shark experts can also come out of this book having learned a lot about the people who spend their lives interacting with sharks. Well worth picking up. As someone who has long depended on and espoused the quality of Bigelow and Schroeder’s Fishes of the Gulf of Maine, I’ve long waited for something of both that level of detail and that level of geographic specificity for sharks. Apparently José Castro has spent the better part of his career trying to make that happen, and this is the result. Unlike Demon Fish, this book stands no chance of being a quick summer read, and is geared towards scientists or readers with some knowledge of technical fish terms and biology. However, if you’re trying to identify any shark potentially found in North American waters (both the Atlantic and Pacific), this can probably settle any uncertainty for you. Helping this cause are the beautiful and extremely accurate illustrations by Diane Rome Peebles, which make this one of the most visually impressive fish ID books I’ve ever had the pleasure of thumbing through (any chance of prints of these illustrations becoming available?). My one minor gripe is that the recent reclassification of North Pacific spiny dogfish isn’t really addressed, but that likely happened after this book was finished (maybe it will show up in later editions). Come for the amazing illustrations, stay for useful info. Pingback: Thresher Sharks vs. Whales – Finding Melville’s Shark? | Ya Like Dags? Pingback: Blacktip or Spinner? | Ya Like Dags?